Cost of Quality (COQ) is a way to measure the cost of waste, rework and customer dissatisfaction in your business. By knowing these costs, the organization has a tangible measurement of financial gains that can be made by improving quality, reducing mistakes and making things right the first time. In actuality, COQ is really more a measure of the Cost of POOR Quality and often you will see the COQ expressed as COPQ. After all, if there were no defects or rework, there would be no costs associated with them. 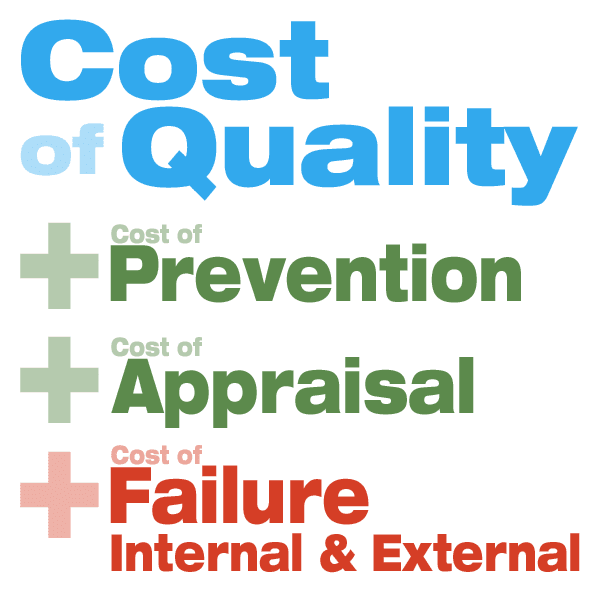 Cost of Quality is a comprehensive measure that is made up of the cost spent preventing problems from happening in the first place, the cost of finding or detecting problems before or after they occur, and the cost of failures which can be found before they get out to the customer (internal failures) or they can be found by the customers (external failures). Here is a powerful way to think of the Cost of Quality. What if someone told you that within your business, whether it is a hospital, a factory or a grocery store, you have a separate little business that is a miniature, mirrored image of the full-sized operation, basically, a hidden factory. The only difference besides size is that everyone’s job in this mini-operation is to make, find or fix bad products or services, all day, every day. The equipment in the mini-facility is dedicated strictly to making bad products and reworking the rejects if possible. The inventory…you guessed it. It will all become scrap. The thought is appalling! No one runs a business to produce bad products or to frustrate customers with poor service. Yet, it happens every day, in every business. Using Cost of Quality measures is a powerful way to get the organization focused on improving quality and the result will be better profitability.